"What you call Vegita and a Goku? Vegito sounds all right" "Kakarotto and Vegeta fused, so my name should be Vegetto"
The above info came from Big Hamster, and was edited by yours truly (contact me). The image came from The DBZN. Vegetto is the potara fusion (fusion by means of the potara earing) of Vegeta and Kakarotto during the Buu Saga. Like Vegeta, he is also proud and strong. An intense yellow beam of ki energy in the form of a sword, that can be extended to any legth Vegetto deires. Vegetto forms five yellow balls of energy, one on each finger, then hurls them at the opponent. They create an explosion and lots of smoke on contact. A fusion of the final flash and the kamehameha wave. Vegetto puts both his hands in front of him and forms a bright whitish blue ball of energy that grows to about the size of him. Blue sparks shoot out of the enrgy ball, and Vegetto is surrounded by a blue aura. Vegetto fires off the ball, which creates an enormous explosion and lots of smoke on contact. 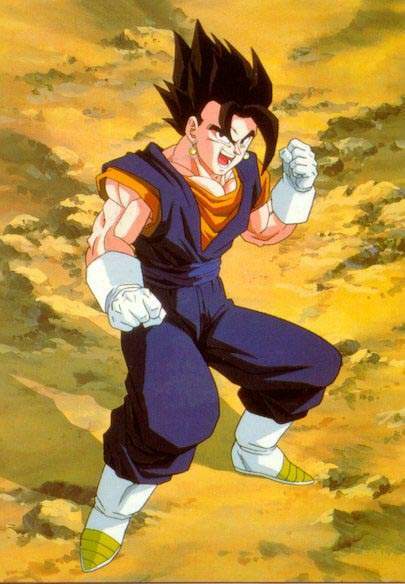 Whereas Vegetto's fusion was accomplished by Potara fusion (fusion using Elder Kai's earrings), Gogeta was created through the fusion dance. Apparently the earring fusion is 100 times more powerful than the dance fusion, but then it is also supposedly permanent. Editor's Note: The age listed is just the age he looks, not his actual age. I mean, this is two different people fused together here, how can you really expect to list an accurate age and have it make sense? Sure we could say he's zero years old, or we could average the two ages to come up with something, but really, this is all fiction here, so just go with it.